Scanned monochrome photograph of Dornoch Cathedral choir concert dressed for period sketch. Named individuals back row l to r: Barbara Reeves, Ingi Manson, Mr Nicol Calderwood, Mr G McCarthy, John Calder, Mr Broadhead, Jeanette Bremner, Capt WW Stuart and Lynn Calder. 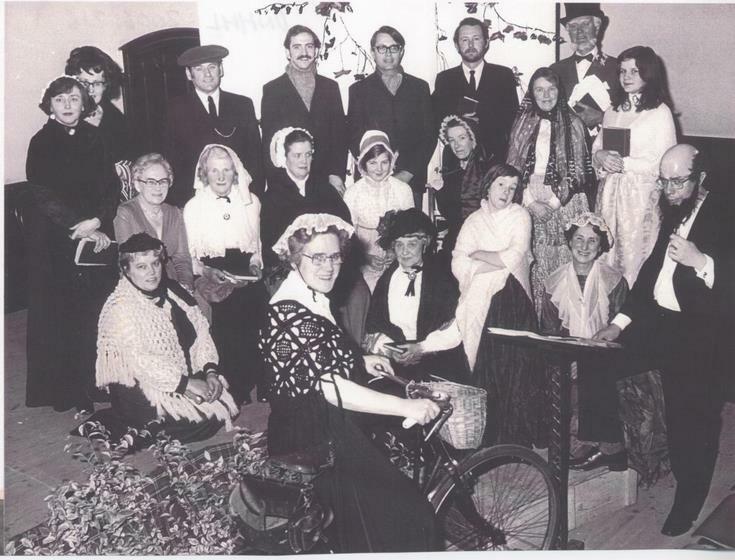 Middle row: Mrs Anderson, Una Mackenzie, Evelyn Calder, Carol Mackie, Bridget Davidson. Front: Mrs Phimister, Margaret Murray, Beth Thomson, Alex Goskirk, Jean Gunn and Donald Goskirk. Next to Jeanette Bremner, we believe it is Captain Stewart-Fitzroy.